Recently I landed this October 26, 1926 Boston Advertiser on eBay. A very dramatic headline and an uncommon shot of Houdini. Thought this was one worth sharing on Instagram. #Houdini Enjoy. I left a comment on Instagram under my "musenloki" name, but I thought I'd ask here what year that photo might be from? Any clues as to which bridge jump it was from? (I'm assuming it was shot just before a bridge jump)? Yes. Considering the paper, it's very likely this is from his Charles River/Harvard Bridge jump in 1908. The famous shot of him facing camera with Bess and a crowd behind him is from that same jump. What makes this newspaper unique and valuable is that, as tabloids will, is really in our face about the fact that Houdini was dying. This page is dated Oct 26. That's the day after Houdini was first operated on. 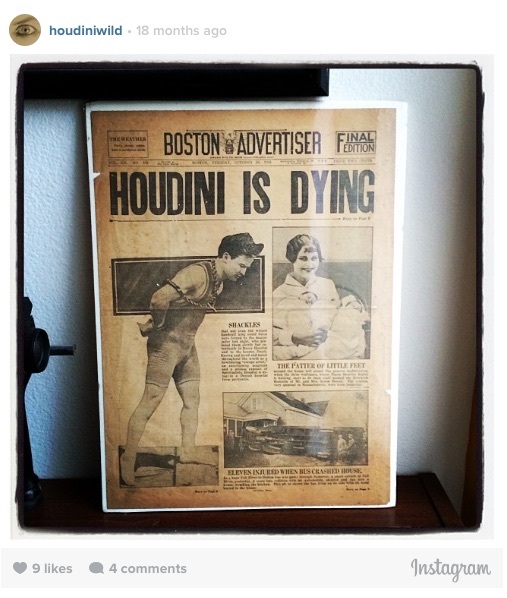 I've seen hundreds, no exaggeration, and hundreds of clippings from Houdini's final illness. I've never seen one that blatant. It's a beautiful piece anyway and would be if it were only describing a bridge jump, but, the other papers were couching it in much more subtle terms. The bulletins do get steadily worse, then, he makes a fight of it, some news includes some hope, then the prognosis gets bad again after a second operation. All the time we are reading "condition grave" "we are hopeful" "somewhat improved," but that paper you have--a very nice score, chief--kills him right off the bat. Thanks, Patrick. Yes, I was thrilled to land this. This is one to get framed.